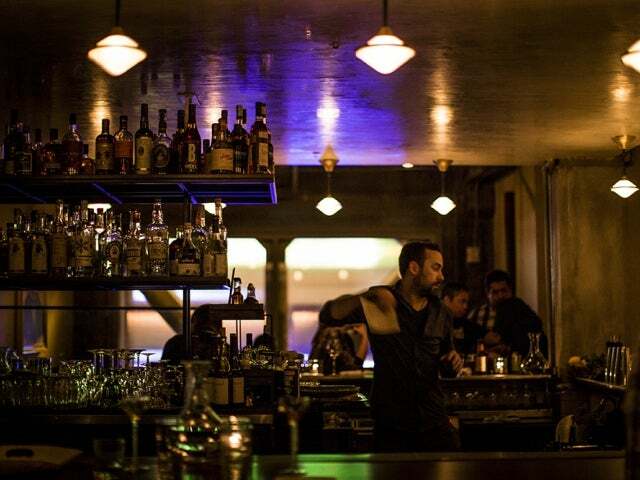 This hard to find bar, hidden behind an unmarked side door near a popular club is the work of talented duo of Brian Felly and Mo Hodges, whose experimental and innovative earned them quite a following at Big. This hard to find bar, hidden behind an unmarked side door near a popular club is the work of talented duo of Brian Felly and Mo Hodges, whose experimental and innovative earned them quite a following at Big. These guys enjoy pawing at the lines between what goes on in the kitchen and behind the bar, creating drinks with culinary twists, where savoury and sweet intertwine. Together with bartender Alex Conde they have created a regularly changing drinks list which includes complex treats like Rancho Palomino, a cocktail which pairs tequila with caraway-scanted Kümmel liqueur and housemade grapefruit and coconut curry syrup. It’s subtle, spicy, savoury – a drink to linger over. We also love the sound of the Salt & Smoke, a blend of Islay Scotch, fino Sherry, Benedictine, salted orange-chili oil, and bitters. The bartenders really know their stuff, and, as at Big, are happy to chat with the customers, and custom craft a drink to your preferences. There’s no food menu as such but they do serve beautifully fresh oysters. There’s no need really when the contents of your glass is a meal in and of itself.